PEP therapy works by having individuals breathe through a face mask attached to a piece of equipment called a resistor, which builds up pressure in the lungs. This is measured by a manometer (pressure gauge). The pressure keeps the airways open, allowing air to get behind the mucus. The mucus can then be moved to the main airway and be cleared by coughing. 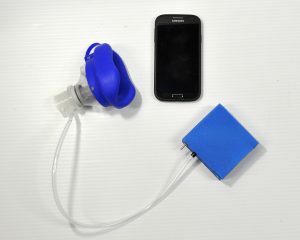 The Bella Box™ with Bluetooth is an electronic manometer we developed that connects to the PEP mask and resister. It transmits to mobile app, that can be downloaded on any Android device, and measures the breaths of each PEP therapy session. The app then uploads the results to the cloud via the data tracking web app. 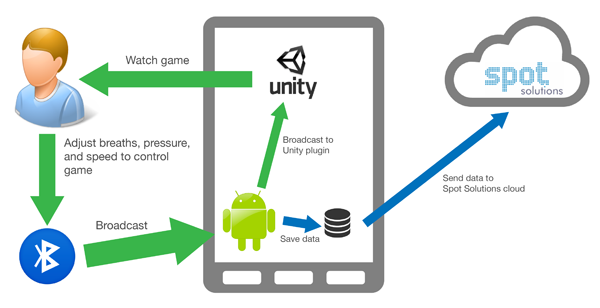 The games that were made at the Game Jam were all developed on Unity3D and are controlled through the breaths measured by the Bella Box™. Check out some of the games our jammers were able to make!